Do you take pride in cooking great food for yourself, your family, and friends? Are you an extremely busy individual that is on the go all day long? If you nodded your head "Yes" then this book was written for you! Sous vide has many benefits for people who are busy during the day. Once you understand how to take advantage of these benefits you can get great meals on the table while working around your schedule. 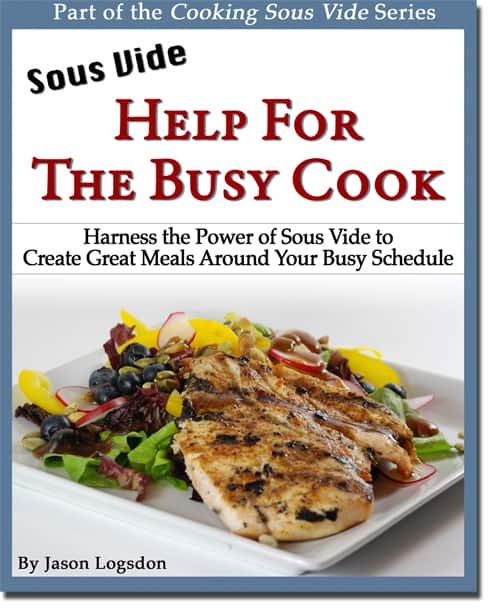 That's where Sous Vide: Help for the Busy Cook comes in! Using the techniques presented in this book and more than 100 recipes, along with a little planning, and even the busiest person can create great meals. If you want to serve your family great meals, even on your busiest days, then this book is for you! - Are familiar with sous vide and are interested in finding out more about how to use it for different applications. - Have busy schedules that they need to cook around. - Want access to 101 tasty and easy to make sous vide recipes. Expert cooks who already know a lot about using sous vide and are only interested in learning about advanced sous vide techniques and recipes. People with no experience or knowledge of sous vide. As well as people overly concerned about the safety of sous vide, and anyone not willing to explore new cooking techniques. Jason Logsdon is a sous vide enthusiast and a main contributor to CookingSousVide.com, the author of 4 sous vide cook books and the developer of several sous vide iPhone and Android apps. Jason is a home chef who is passionate about sous vide and making great tasting food in everyday kitchens. You can follow him on Twitter at @jasonlogsdon_sv. We take a look at several types of sous vide equipment and several sous vide setups. Explore our collection of sous vide recipes and send us your own for us to post. Let us help keep you up to date with the latest developments in sous vide cooking. Have a question you just can't find an answer to? Let other cooks give you their best advice. Disclaimer: Sous vide is a new and largely untested method of cooking. It carries many inherit health risks that may not be fully understood. The information on this site is for informational purposes only. Anyone undertaking sous vide cooking should fully inform themselves about any and all risks associated with it and come to their own conclusions. Following anything on this site may make you sick and should only be done if you are fully aware of the potential complications.